Relive the Gosnell trail: Five weeks of testimony, one witness after another (54 witnesses total) telling of beheaded babies, snipped spines, and a filthy clinic. Jurors were shown color photos of aborted fetuses – some as old as seven months, others allegedly born breathing and moving – and sat near an array of aged equipment from the West Philadelphia abortion clinic. Gosnell’s defense did not bring up a single witness. Below are highlights from the trial as Pennsylvania Family Institute closely followed the case unfolding. And be sure to watch the Gosnell movie (GosnellMovie.com) as well as the one-hour documentary that interviews the real people involved – including Gosnell himself (3801Lancaster.com). Location: Common Pleas Court with Judge Jeffrey P. Minehart at Philadelphia’s Criminal Justice Center. Gosnell routinely performed late term abortions, forced women to go into labor and killed born babies. Gosnell ignored the 24-week ban on abortions as well as the 24-hour rule. Accused trial being a “prosecutorial lynching” of his client. First Witness: FBI Agent Jason Huff, Part of the team that raided the clinic in 2010. At the raid, clinic full of women moaning, heavily medicated, bleeding and in tremendous pain. Agents allowed Gosnell to continue his abortion procedures before being submitted to questioning (raid was investigating illegal drug sales – not his horrific abortion practice). When he was finished, he bought dinner and sat down for questioning without taking off his soiled surgical gear. Said it was unfair to expect an abortion clinic serving poor women in a “nitty gritty” neighborhood to meet the same standards as a respected medical facility. Snipped the spine of at least 10 babies born alive. Women came from across the Mid-Atlantic, often seeking late-term abortions. She took a photograph of one baby she thought could survive – given the size (she measured him at 30 weeks) and pinkish color. “The aunt felt it was just best for (her mother’s) future).” Gosnell joked that this baby was so big he could have walked to the bus stop. Shay’Quana Abrams, Mother of Baby Boy A – one of 7 Gosnell is charged with murdering. Her baby was one Moton took a photo of – given the baby’s size. Her abortion took place around the 30 week mark. In her file, 3 ultrasounds were taken on July 10, 2008 – each with the size of the fetus getting smaller until the third showed the baby at 24.5 weeks (Gosnell accused of manipulating ultrasound images. It is also illegal to perform abortions past 24 weeks). Never went through the 24-hour waiting period. Complications occurred after her abortion and forced her into the hospital for 2 weeks. Estimated the age of Abrams’ baby (Baby Boy A) to be 27-31 weeks old at time of abortion. Said at that age, the baby has an 85% chance of surviving when born. State law requires doctors to try to save any baby (as young as 22 weeks) born prematurely if there are signs of a heartbeat, breathing or movement. Any doctor should have an anesthesiologist monitoring a patient under sedation. Critical medicine available at Gosnell’s clinic expired in 2007. Toxicology results showed 710 micrograms-per-liter of Demerol in Karnamaya Mongar’s system after her death. Therefore, Mongar was given more than the 150 mg of Demerol in the span before her death. Inspected the clinic at the time of the drug raid in 2010 (first one conducted by the state since the early 1990s). There was “filthy” and “corroded” tubing in medical machines inside the clinic and broken equipment blocked a padlocked emergency exit. Speaking with current patients during this inspection, some complained of cramps and bleeding. Two women had same-day procedures, received no counseling and were not subjected to a state-mandated 24-hour waiting period. Patients were not connected to any device measuring their vital signs and only 1 employee was present. Ordered two of the women to be taken to the hospital. The emergency door – like the evening Ms. Mongar died – was chained and locked again. She returned a few days – asking Gosnell to voluntarily close his clinic. Answered a 911 call on Nov. 19, 2009 at 11:15pm from Gosnell’s clinic about the death of Karnamaya Mongar. Gosnell and a female worker were present but neither were doing anything – no sign of emergency resuscitation. The hallways were so narrow that it was impossible to use a stretcher to take any patient to the hospital. The emergency door – a few steps from the procedure room – was chained and padlocked. Neither Gosnell nor any staffer had the key. Mongar died later at the Hospital of the University of Pennsylvania. Toxicology tests from Ms. Mongar’s autopsy showed she died of an overdose of Demerol. When the final death certificate was filed on Dec. 17, 2010, the manner of death was listed as homicide. Collins began to revise his conclusion in September 2010, after a county investigating grand jury was impaneled and the District Attorney’s Office began providing him with additional evidence. He received police statements taken right after Mongar’s death from Mongar’s daughter and three workers present the night she died at the clinic. He also toured the abortion clinic in October 2010. Elizabeth Hampton, Clinic Employee – charged with lying to the grand jury about the death of Karnamaya Mongar. Started working at the clinic in 1999 doing housekeeping and eventually answering telephones. $10 an hour under the table. Job included cleaning out the suction machines used to remove fetal remains during abortions. She would pour the jar of red liquid from the machine down a sink drain and turn on the garbage disposal. She said she did not know if the liquid contained fetal body parts. Returned in 2009 to answer phones. One month later, Ms. Mongar died and in Feb. 2010 the raid on illegal drug sales occurred. 5-year employee of Gosnell, left in June 2008, made $300 a week. Background: Massof was charged with first-degree murder for killing infants born live and viable during abortions (Gosnell also charged). Unlike Gosnell, Massof struck a deal with prosecutors and pled guilty to 2 counts of third-degree murder in exchange for his testimony and a lighter prison sentence. Also, pled guilty to 30 counts of using Gosnell’s prescription pads for controlled narcotics (Gosnell faces these charges after this trial). Decided to become a doctor, in looking for residency program – found Gosnell’s clinic. His medical degree was from Granada in the West Indies and he never completed a medical residency before he began working for Gosnell in the summer of 2003. Within a month Massof was seeing his own patients and writing prescriptions. He moved on to assisting Gosnell in late-term abortions and soon was doing them himself. He was involved in late-term abortion procedures – remembering the most extreme case he witnessed was an abortion at 26 weeks. Massof would perform ultrasounds and admitted that the clinic’s ultrasound machine was manipulated to make babies appear smaller and therefore younger. Some patients were highly sedated or unconscious and were not monitored by any medical equipment. Gosnell admitted that 10 to 20-percent of the fetuses found in plastic bags in the freezer “may have been” over 24.5 weeks old. Hired in October 2008. No training or certification qualifying her to do some of her roles including ultrasound examinations, administer anesthesia or monitor patients. She recounted a horrific experience when one baby, who she described as 18-24 inches long, was born alive. “There was this clear glass pan, and I saw it, and I thought, ‘What do you expect me to do?’” West told the court. After the death of patient Karnamaya Mongar, Dr. Gosnell held a staff meeting to reassure employees, but no procedural changes were made for administering medication. West pleaded guilty to 3rd degree murder and conspiracy. In her testimony she said she is not guilty of her crimes and that she felt loyal to Gosnell. Hired to work full-time in 2008. Previously worked for 10 years with Gosnell at the now-closed Atlantic Women’s Medical Services in Delaware. Hired initially to clean instruments but shortly was providing anesthesia to abortion patients, performing ultrasounds, administering drugs and snipping the spinal cords with scissors of babies born alive. She was not certified or licensed to perform any of these responsibilities. She followed Gosnell’s orders one time and took a baby that was delivered in a toilet and snipped its neck. She asked Gosnell about the baby that moved, and said Gosnell told her it was just an “involuntary response” and a “last breath” because it was “already dead” due to drugs that had been administered earlier. Admitting that she had seen Gosnell cut the necks of at least 30 babies born alive. During her 15 months working with Gosnell, he routinely changed paperwork on patients that were too far along in their pregnancies to get an abortion in Pennsylvania to make it appear they were at the legal limit. Sometimes pain medication was either out of date or did not work and she saw Gosnell “smack” the legs of patients that squirmed during the procedure, hard enough to leave a hand print. Williams gave Karnamaya Mongar repeated doses of pain medication in the hours before her abortion because Mongar was uncomfortable. Hours later, during the abortion procedure, Williams said she saw Mongar’s skin turn grey and her breathing slow significantly and warned Gosnell. Williams said Gosnell ignored her and continued the procedure. When Mongar’s abortion was completed about 10 minutes after Williams’ warning, she said Gosnell checked on Mongar’s pulse and immediately began doing CPR and ordered Williams to go get help from another staffer. They never hooked patients up to monitoring devices to check their pulse, heartbeat or breathing and the one monitoring machine they had in Gosnell’s clinic never worked. She monitored patients by simply looking at them and watching for a pulse in their neck veins. It was standard procedure at the clinic to give all patients the same doses of medicine – as outlined by a chart on the wall — and they did not make any changes due to weight, age or other medical factors. At 15 years old, hired by Gosnell. Went from answering phones to doing ultrasounds, administering intravenous medicine, and, ultimately, assisting Gosnell in abortions. Saw at least five aborted babies moving, breathing, and, in one case, “screeching” after late-term procedures at the clinic. Never performs abortions on women pregnant more than 21 weeks, and those he does are done in a hospital with full medical services available. Has performed 40,000 abortions over 30 years. Performs abortions up to 17 weeks in a clinic and up to 14 weeks in his personal office. Has an anesthesiologist or nurse-anesthetist assisting in hospital or clinical abortions. He uses a registered nurse to help in office abortions performed with local anesthetics. Examined 47 aborted fetuses that were found in the freezer of Gosnell’s clinic. ranged in age from 12 weeks – the end of the first trimester – to late second trimester, and included two that looked beyond the 24-week limit for legal abortions in Pennsylvania. “There was no guidance on how to proceed,” adding that he asked fellow coroners, medical examiners, and forensic pathologists, who were as stumped as he. Toilets backed up one-two times a week. Opening the outside pipe, baby parts such as babies’ arms came spilling out. Yashoda Gurung, daughter of Karnamaya Mongar who was killed after a botched abortion by Gosnell. By the end of the procedure, her mom was in a coma. Testified through a translator, wept seeing pictures of her mother. Drove his sister and family to Gosnell’s Women’s Medical Society. Firefighters had to use bolt cutters to open the emergency exit leading to a ramp to the sidewalk. Abortion patients were routinely overmedicated and that sloppy record-keeping sometimes made it impossible to know how much of a dose patients had been given. Stopped assisting Gosnell in abortions in 2007 after a procedure in which she was the de facto anesthetist. Saw babies precipitate ( term they used for dealing the aborted babies alive before allegedly cutting their spinal cords) at 23 to 28 weeks. No steps were ever taken to attend to these babies; “we never even checked to see if [there] was a heartbeat.” Recognized that the larger precipitated babies were viable: … The bigger cases, you would see more movement or the baby would look a little bit more realer to you. Answer: Like the skin would be a lot different. The color of the skin would be a lot different. October 2008 – took 10 photographs showing unsanitary conditions and fetal remains at the clinic. Witnessed more than 14 babies born alive at the clinic. More than 10 babies were breathing, with their chests moving up and down – only to be killed. One of her photographs, shown to jurors on a large screen, showed specimen jars containing the feet of aborted fetuses, which Dr. Gosnell said he kept for DNA purposes. Another showed ‘the largest baby she had ever seen’ aborted at the clinic. The gestational age has been estimated by some trial experts to be nearly 30 weeks. Gosnell regularly did late second-trimester abortions and third-trimester procedures that he documented as 24.5 weeks. April 22, 2013 – Kermit Gosnell’s defense rests without a single witness. Kermit Gosnell is convicted of three counts of first-degree murder for the death of three babies that were born alive and killed. Also convicted of involuntary manslaughter in the death on Karnamaya Mongar. Conducting a search warrant raid for illegal drug activity, investigators find the true horrors taking place at the Women’s Medical Society – a late-term abortion facility uninspected for decades. Investigators find blood stained floors, urine stench in the air, semi-conscious women in the recovery room and jar after jar of fetal remains. 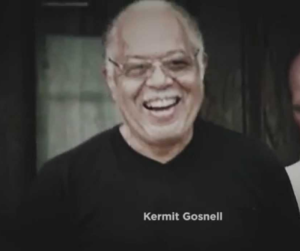 Kermit Gosnell’s medical license is suspended by Pennsylvania Board of Medicine. Department of Health files papers to begin the process of shutting down the clinic. Grand Jury releases report on its investigation into the criminal activity of Kermit Gosnell and the Women’s Medical Society. Gosnell is charged with the murder of 7 babies and 1 adult – Ms. Karnamaya Mongar. Final State Senate vote to concur with State House amendments to SB 732 – treating abortion clinics just like any other surgical facility in the state (with mandated inspections). Federal court arraignment hearing on Gosnell selling “prescriptions” for close to a million pills containing the narcotic Oxycodine and the generic of Xanax. Pretrial motion hearing for Gosnell. 3 Jurors Selected (need 12 with 4-6 alternates). Selection of 12 jurors completed. Trial begins – Common Pleas Court with Judge Jeffrey P. Minehart at Philadelphia’s Criminal Justice Center. 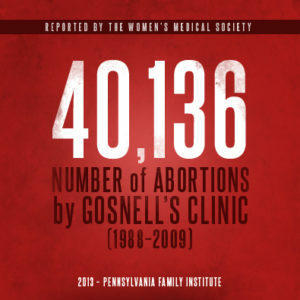 Watch the Gosnell Movie – now in select theaters. For details, visit GosnellMovie.com. After the movie, watch the one-hour documentary that interviews the real people involved – including Gosnell. To watch the documentary and for more information, visit 3801Lancaster.com.